Create the desire for the client to want to buy salon retail. The reality is that most salons are only achieving around 7% of total salon revenue on product sales, so if you are not amongst the 35%ers, you are not alone. UNFORTUNATELY there is no simple route to retail success because as an industry we have forever allowed the client to purchase inappropriate products from the high street and the purchasing habits of the client are hard to break. FORTUNATELY there are working procedures that can dramatically increase salon retail sales but this involves adopting formal working “routines”, policies and practices. Any kind of formal working procedures in our industry are often shunned as being to draconian for hair and beauty staff because “we are creative individuals not factory clones.” But did you ever notice that the staff who are not willing to try new things are more often than not your weakest team members? Whatever service your client has received they leave the salon looking and feeling brilliant, and in order for them to re-create this feel good factor at home, surely it is essential for the client to use the same products the stylist used to create the style and condition. Clients are switching to buy salon retail in increasing numbers from those salons that carry out expert consultations and follow through with realistic recommendations made by matching professional products to the real needs of the client. A professional stylist will accept full responsibility for client product sales by creating the desire for the client to want to buy products, as most salon product sales should be as a result of expert consultation followed by demonstration and recommendation. The consultation, demonstration and recommendation process must be structured and it should form part of you salons FORMAL WRITTEN client-stylist work-flow routine. Successful retail strategy begins when the client enters the salon and only ends when the client exits the salon following a great service. There is no one section that teaches retail, conversely every part of the client-stylist work-flow will add to great retail results if performed correctly, beginning-to-end. I opened this Key Note on retailing by stating “no stress for the stylist” However, salon staff retail performance must be targeted, measured, managed and remedial action taken if team members fall short of their targets. This is not a contradiction because retailing is an essential business skill for a stylist and therapist. If they are not achieving a minimum of 20% client/retail conversion then they are not trying and that is not acceptable. Salon staff that are negative toward retail or do not try for whatever reason are suffering from negative conditioning and it is our job to treat the condition, just like a doctor would treat a patient. The treatment is to teach retail sales skills to salon staff via personalised copies of the FORMAL WRITTEN Client-Stylist Work-Flow Routine; we work on building their confidence and ability, akin to treating a patient with a course of antibiotics. Retail responsibility should be on your employees’ job description and it should be in the contract of employment and employee handbook. Only then can you take disciplinary action for “performance” against an employee who refuses to improve and contribute. If retail responsibility is not included in your employee contracts and employee handbook then you should consider purchasing new staff contracts from us. Motivate staff with manufacturer incentives at no cost to you! Do not pay commission on retail sales; retail is an integral part of the job. 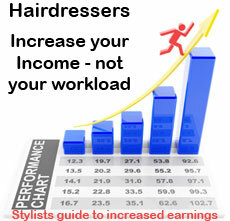 How much does the Advanced Salon Retail Course Cost? 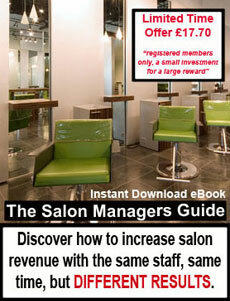 Registration to the Full Column Salon Advice Store is FREE. To Purchase this course or to register for a salon trade account please visit our Salon Advice Store. PLEASE NOTE you will need to register and be verified for a salon trade account to see the special salon trade prices.